A place in the main event the goal, in the qualification tournament for the 2017 ITTF Challenge Spanish Open in Almeria, the leading players in the Women’s Singles event enjoyed a trouble free day on Wednesday 22nd November but there was disappointment for the host nation. Notably, the Czech Republic’s Dana Cechova, the leading name on duty made a successful start to her campaign as did the French duo of Laura Gasnier and Stéphanie Loueillette; likewise Switzerland’s Rachel Moret was relatively untroubled. The disappointment was the defeat of Zhang Xuan, hoping to make her mark on proceedings and listed at no.222 on the current Women’s World Rankings, she was beaten by Korea’s Kim Danbi, a player new to the international scene and thus with no global status. 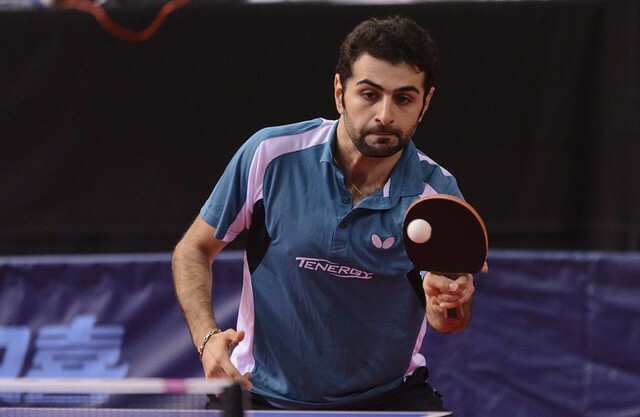 A successful opening day for the top four names in the Women’s Singles qualification event; in the counterpart Men’s Singles competition there was one casualty of note. The fourth highest listed player on duty, Turkey’s Ibrahim Gündüz endured torrid times; he was beaten by both Nigeria’s Olajide Omotayo (12-10, 11-5, 3-11, 11-8, 12-10) and by Kazakhtan’s Denis Zholudov (12-10, 11-5, 3-11, 11-8, 12-10). Olajide Omotayo and Ibrahim Gündüz now meet to determine first place in the group. Meanwhile for the next two names in the order of merit, matters are out of their hands. Scotland’s Gavin Rumgay lost to Italy’s Jordy Piccolin (11-6, 8-11, 10-12, 11-7, 13-11, 8-11, 11-8) but beat Sweden’s Oscar Perman (12-10, 11-9, 6-11, 11-8, 11-7). Similarly, Belgium’s Lauric Jean suffered against Canada’s Marko Medjugorac (11-6, 13-11, 11-6, 7-11, 4-11, 6-11, 11-8), before recovering to overcome Anders Eriksson, like Oscar Perman from Sweden (8-11, 4-11, 8-11, 12-10, 13-11, 11-6, 11-8). Jordy Piccolin now meets Oscar Perman; Marko Medjugorac opposes Anders Eriksson to determine the final order; top spot means a direct entry to the main event, second place and a preliminary round awaits, third position is farewell. Problems for notable names in the Men’s Singles qualification tournament, not for the top three; Sweden’s Hampus Soderlund, Austria’s Andreas Levenko and Belgium’s Martin Allegro duly concluded their group phase matches unbeaten and are thus through to the main event.